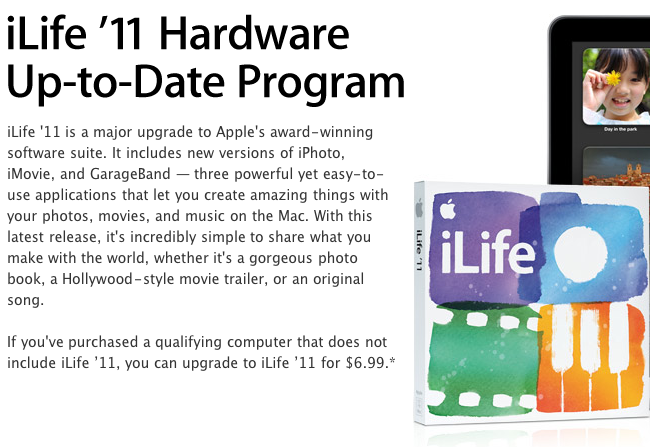 If you just bought a Mac between October 1st and October 19th or even after, you are eligible for Apple's iLife 11 Hardware Up-to-Date Program which allows you to upgrade and purchase iLife 11 for just $6.99 including free shipping instead of the full retail price of $49. This program is mainly done online thru Apple.com where you will need to fill out a very quick and simple form with your Mac's serial number, date of purchase and place. You can directly visit the iLife 11 Hardware Up-To-Date Program page and order your iLife 11 update here. Any Macs that are purchased after October 20th will already come with iLife 11 installed. Apple states that if you do not receive iLife 11 already with a Mac that you've purchased after October 20th, you will need to go thru the Up-to-Date program and order yours for $6.99.